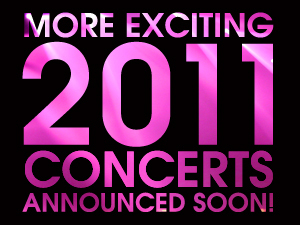 Home > News > News > More Exciting 2011 Concerts Announced Soon! More Exciting 2011 Concerts Announced Soon! We’ve already announced lots of terrific concerts coming to the AMT stage in 2011. Check out our impressive schedule so far! BUT … we can’t spill the beans just yet, so keep checking our website, or join our Email Club to be the first to find out when we break the news!